That is quite the pair of games. PlayStation 4 and Vita owners with PlayStation Plus will be receiving an excellent pair of games this month that are worth revisiting or playing for the first time, depending on your past experience. The first game here is Super Meat Boy, the tough-as-nails platformer where the player controls an anthropomorphic cube of meat out to save his girlfriend, Bandage Girl, from the evil Dr. Fetus (and yes, he is actually a fetus). The game starts off pretty simple, ramps up the difficulty to rage inducing, and does not let up. If challenging platforming and excellent music are up your alley, Super Meat Boy will be a nice addition to your PS4 collection. The second game, Broken Age, is a Kickstarted point-and-click game by Tim Schafer and Double Fine. The coming-of-age story chronicles the lives of two teenagers with no connection, but whose situations are strangely similar. The art is charming and the writing is full of humor, brought to life by an excellent cast of voice actors. Broken Age was originally released in two separate acts, but this release includes both. 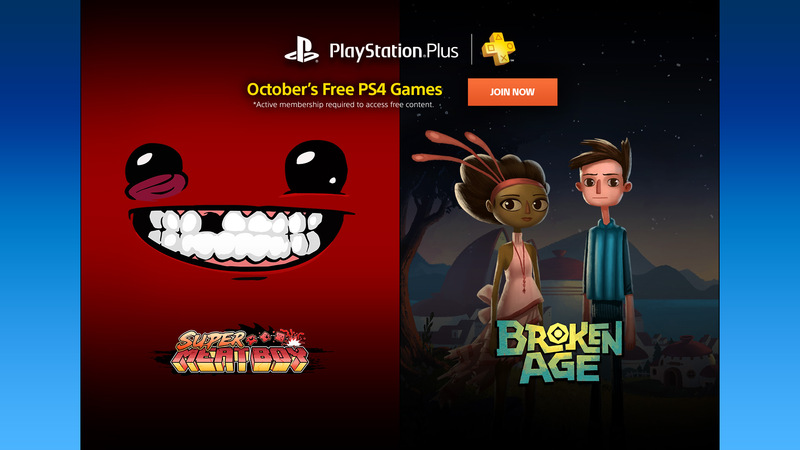 Currently, the free titles for September are still available, but the games listed above will become free on October 6 for PlayStation Plus members. Check back on the first Tuesday of every month for new free titles for all three Sony systems.